Which biochemical pathways are regulated by mechanical signals? 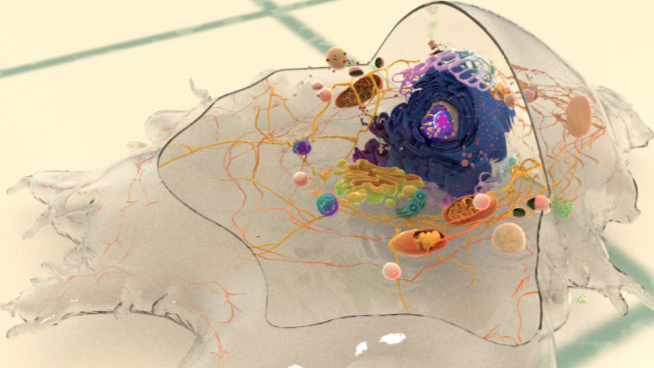 Cells are capable of relaying mechanical stimuli from their physical environment all the way down to the nucleus through electrochemical, biochemical or mechanical pathways. In many cases the activation or suppression of a given pathway by a mechanical cue gives rise to alterations in gene expression. This may be described by a simplified model where the local rigidity of the extracellular matrix is first detected at focal adhesion sites by stretch-activated and integrin-like transmembrane receptors (reviewed in ). The transduction of the signal subsequently occurs via physical (localized contraction or alteration of the cytoskeleton) or chemical (diffusion of soluble intermediates) pathways. Simplified model of mechanotransduction. 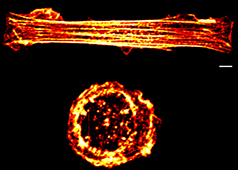 Focal adhesions detect physical stimuli from the substrate, and transmit this information to the nucleus, either directly along the actin cytoskeleton or in conjunction with biochemical signaling pathways, such as phosphorylation. Purely mechanical signaling is fast, on the order of milliseconds, while a combination of mechanical and biochemical signaling takes seconds. A long-distance propagation of mechanical force can take place through physical modulation of the cytoskeleton which requires the cell to have non-uniform stiffness (as predicted by the tensegrity model ). Such physical force propagation (often referred to as stress wave ) takes less than a milli second to reach the nucleus. On the other hand, extracellular mechanical signals can also be transmitted to the nucleus via biochemical pathways initiated through conformational changes in mechanosensitive proteins and leading to chemical signal propagation and amplification. Unlike the rapid propogation of signals via stress waves, diffusion of soluble proteins or ligands through the cytoplasm can take tens of seconds to occur. These proteins or ligands must also interact with downstream mediators before eventually reaching the nucleus and initiating changes in gene expression. This final ‘end point’ in the pathway can be achieved through activation of transcription factors, the formation of transcription complexes or through a physical remodeling of chromatin or other nuclear components. Of particular importance in biochemical mechanotransduction are phosphorylation events or other post-translational modifications of proteins, as these events are often associated with changes in transcription (reviewed in ). This is observed, for example, when mechanosensitive proteins such as zyxin, paxillin, β-catenin, which are normally situated within focal adhesion complexes or at cell-cell junctions, translocate to the nucleus upon mechanosignal-induced phosphorylation. Similarly, transcription-relevant factors may be sequestered in the cytoplasm (e.g., NFkB, STAT3, NFAT) and translocate to the nucleus after they are phosphorylated by upstream mechanosensitive mediators (e.g., focal adhesion kinase (FAK) activates NF-kB in response to fluid shear stress ). In other cases, the transcription-related factors may already reside inside the nucleus (e.g., EGR1 ) and when stimulated, bind to specific regulatory sites on DNA to initiate gene expression. What types of signals do cells use to communicate? How can disrupted mechanosignaling lead to diseases? What is the Canonical Wnt Receptor Signaling Pathway? What is the Hippo-YAP/TAZ tumor-suppressor pathway? What is the NF-kB pathway? What is epidermal growth factor signaling?